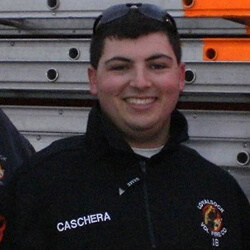 Rich Caschera, 20 Penn State University, Security and Risk Analysis Jersey Surf Front Ensemble, 2006-2011 What do you think is important in choosing which corps to audition for? The most important factor in choosing a drum corps is finding the right environment. As a corps member you want to be at a place that you can feel confident in yourself. Each person plays an important role in the drum corps both on and off the field. That personal confidence will allow you to adjust to anything that might come your way. How do you like to prepare for an audition? Preparing for an audition can be difficult for some and easy for others. I personally like to start preparing as early as possible. When I receive audition music I always try to get a recording of it. Practicing the night before does not work. Breaking down the music by section and even by count helps for difficult parts of the music and exercises. Most new members feel afraid to count out loud at camps, but if it helps, do it. An instructor once told me: "If you can say it, then you can play it." In addition, listening to the material helps you know the parts and gives an understanding of where your part fits. Drum corps is a physical activity even in the front ensemble. Our equipment is not the easiest to move around a football field and requires physical strength. Working out will help—jogging, weight lifting, pushups, etc. What was your experience like the first time you auditioned for a corps? I was really nervous when I auditioned the first time. I did not know anyone, never slept among hundreds of other kids in a gym, and constantly practiced even at the camp. It was nerve-racking auditioning against older high school, and even college members. Standing next to other potential members in a group setting larger than your high school group or college section can be uncomfortable and intimidating. It was a lot to take my first time around. The staff gives out a lot of information, and retaining all of their suggestions can be difficult. I did not make it the first time I auditioned. What advice would you give to somebody who is nervous or unsure about auditioning? I would advise them to go to a camp. Auditionees are getting some of the best instruction in the world. All of the instructors have marched in DCI corps and give some of the best tips that will help to shape you into a better player. You'll easily notice how much improvement you can make over just a weekend. In addition, stay in contact with people you meet at the camp. The staff members are always open to your questions and to make suggestions about playing, musical questions and life skills. I would also advise that you bring comfortable clothes and dress in layers (shorts and sweats). Be sure that you can move easily and comfortably in them. New members will be standing still and marching in place all day long. The only time you really get to sit down is during meal times and at breaks. Part of dressing comfortably also means bringing clothes to be outside, inside, and in various environments. Help out with anything and everything the staff or other members request of you. Staff and administration actually notice members who help out with common tasks at camp. It looks good to show that you are energized, ready to go, and can work well with others. A positive attitude means a lot and can be the tiebreaker in a decision about who to accept in the corps. Any other tips? 1.Bring all the assigned music in a binder with sheet protectors and a music stand. It will help when you're trying to read music during the day in all kinds of weather and environments. 2. Read the corps' audition materials. These are filled with information about what to bring to camp. If something is on the sheet, this usually means there is someone who has forgotten the item in the past. Aerobeds, pillows, and sleeping bags are definitely needed. 3. Introduce yourself and meet other people. Everyone is nervous and getting to know someone avoids eating alone at meal times and makes the camps more enjoyable. Build connections and get to know people. As you spend more time with a corps, it becomes a family. Over the years, you make friends in other corps too and getting reacquainted at competitions throughout the summer or later in college is really neat! Learn more about corps audition dates, locations and additional info.